At least one Washington politician dares to say “tax” out loud — a carbon tax, no less. Both a carbon tax or the auctioning of permits under a carbon cap-and-trade system would generate huge streams of revenue which would come under the jurisdiction of Ways and Means. The Committee has scheduled a hearing tomorrow, Sept. 18, on revenue recycling, and Larson will be on hand, presumably putting the spotlight on the American Energy Security Trust Fund Act he introduced in August 2007. Speaking to an overflowing House banquet room, Larson, shown at right, called a carbon tax “simple, efficient, straightforward and effective” and said it will be a boon to the economy if the revenue is recycled to reduce or eliminate distortionary taxes. 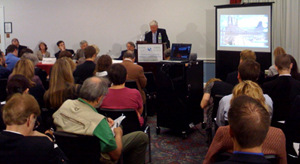 Following Larson, a politically diverse panel of economists — Robert Repetto, Robert Shapiro, Terry Dinan, and Ken Green — discussed ways to maximize the “double dividend” — benefits to climate and to the economy from recycling revenue from either a carbon tax or the auction proceeds of cap-and-trade. Several noted the most egregious flaws of the defeated Lieberman cap-and-trade bill: it would have given away emission permits and auction revenues, mainly to fossil fuel industries, rather than recycling auction revenues downstream to consumers. Panelists noted that energy firms pass their costs downstream to consumers — who will need assistance. Only Repetto, of the UN Foundation, preferred cap-and-trade over a carbon tax, but with either, he wants a tax-shift — auctioning all permits and dedicating revenues to reduce other taxes. Shapiro, a former Undersecretary of Commerce, warned of the costs and instability from price volatility under cap-and-trade, citing the U.S. acid rain program whose permit prices slosh around as much as 80% and the similarly volatile EU climate program which has achieved zero net greenhouse gas reductions. The morning after a disastrously volatile day on Wall Street, Shapiro called volatility the enemy of rational planning and efficient economic decision-making. Shapiro advocates recycling 90% of carbon tax revenue with the remaining 10% dedicated to R&D on low-carbon alternatives. Dinan, author of a series of weighty CBO studies on climate policy documenting the advantages of a carbon tax, suggested ways to move cap-and-trade closer in efficiency to a carbon tax, for example by adding safety valves to limit price volatility. She underscored the efficiency advantages of applying revenues to reduce distortionary taxes such as payroll taxes, vs. distributing revenues equally with pro rata dividends. But Dinan and the new RFF study caution that unlike a straight dividend approach, tax-shifting out of payroll taxes would be acutely regressive, mainly because many low-income people, including elderly and the unemployed, don’t pay payroll taxes and thus wouldn’t benefit from payroll tax reductions. In contrast, dividends would go to everyone, equally, thus benefiting a clear majority of less-well-off individuals and households. Ken Green, AEI resident economist and scientist who has written extensively about the “double dividend” from reducing distortionary taxes with carbon revenues, is rare among conservatives for supporting strong medicine to combat climate change. Because our entire society and every activity in it is built around energy consumption, changing energy prices will have profound effects, he noted, some of which must be offset. Green warned that politicizing climate change legislation or otherwise attempting to favor some constituents over others will “torpedo” the serious effort that is needed. Cap-and-trade hides the truth that we must use prices to change consumption patterns, said Green, and it will breed cynicism and undermine public support for climate protection. The public needs to understand that although fossil fuel prices will rise, they will be “made whole” as a group. During Q&A an audience member noted the consensus for a carbon tax but asked panelists how a tax would provide the certainty that is often touted as the chief advantage of cap-and-trade. Shapiro suggested that carbon tax levels may need to be adjusted periodically to assure that emissions targets are being met. Green contended that powerful incentives for cheating and market manipulation will render cap-and-trade’s emissions certainty largely illusory. He called cap-and-trade a government-mandated constraint on supply, likening it to OPEC’s mission to limit oil supply to support prices. Just as in OPEC, cap-and-trade will bring irresistible temptation to cheat by selling outside the system and will eventually destroy public confidence, Green said. Wow! An elected Congressman, who in all likelihood has hopes for reelections to come, dares to say "carbon tax"! A ray of sun to pierce "the winter of our discontent", as King Richard III called it. Yet, while quoting Dead White Male wordsmiths, "One swallow doth not a summer make" (Cervantes). Sound carbon tax legislation is not being discussed in committee yet. Here’s hoping that Rep. Larson inspires a few more swallows to brave an ever less hostile climate. Oh, I know that what the featured speakers had to way was not new to followers of this website. Nevertheless, that they spoke well of a carbon tax in a House panel discussion is great. What was once said in whispers will soon be shouted from the rooftops.